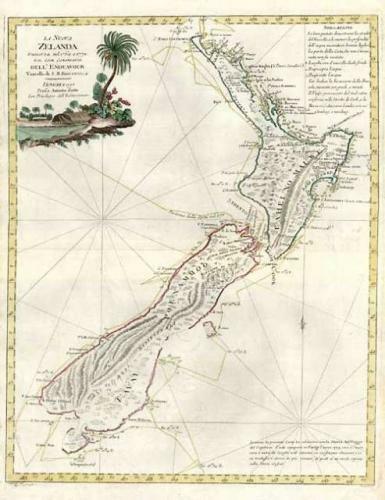 Zatta's map of New Zealand is one of the most decorative and highly sought after editions of Cook's mapping of New Zealand and one of the largest format presentations of Cook's map. The map delineates two islands, tentatively identifying the Southern Island separate. The map shows Cook's tracks around the island, along with the astronomical observations. Nice topographical detail is shown, along with a blend of native and European placenames on the islands. The map includes several annotations. The decorative cartouche shows a native village scene. New Zealand, though discovered by Tasman in 1642, received no further European exploration until the first Pacific voyage of James Cook. Cook sailed the coast of New Zealand for 6 months, proving that it was not part of the Great Southern Continent, as many had believed. Cook visited New Zealand several times, with Zatta's map drawn from information provided in the latest of his voyages.